After the collapse against Miami, I was a little nervous during the final minutes of the BC-Syracuse game. But BC made some foul shots, made some good decisions when breaking the press and didn't have huge defensive lapses in their win over the Orange. Aside from the late game deja vu, the other point that got me nervous was when Syracuse started out four-for-six from 3. Fortunately they cooled off while BC was hot from outside (14-27). Bowman led BC with 23. Robinson 22 and was limited in minutes and aggressiveness due to foul trouble. Reyes started and struggled. Pop came off the bench and looked decent. There were times when BC really handled the 2-3 and other times when they couldn't hit open shots. I am hoping for a win this weekend and a strong showing at the ACC tourney. We need some NIT momentum. After a few days of speculation, BC confirmed that Phil Trautwein has joined Addazio's staff as the Offensive Line coach. He replaced Justin Frye, who went to UCLA. Trautwein is a low risk hire. He's young and knows Addazio and Addazio's teaching well. He's from the Northeast, so there should be an easy adjustment to BC life. The big unknown is his ability to identify and recruit talent. The young guys tend to be the recruiting workhorses, so he will have to jump in head first. Trautwein is a New Jersey native, so hopefully he can help our push in that area. There is plenty of depth and talent at Oline right now. Because positions are in flux, there is potential to screw it up, but I trust Addazio to help Trautwein manage the unit and help them perform at a high level. Good luck to Trautwein and welcome to the Heights. This is a typical marketing video, but it is not from BC. It is from the construction company, so their perspective is a little different. It is less about all the talking points we've heard and more about the construction logistics. Friday night the Men's Team clinched the Hockey East Regular season title and Saturday they followed it up with another win over Maine. The first place finish gives them a bye for the the Hockey East Tournament. BC will host its first Tourney action March 9. This has not been a typical dominant BC hockey season. But who cares? The parity in the Hockey East allowed BC to finish strong and win the title. Perhaps that sort of success can be the springboard to a great spring with a Hockey East Tournament win and then something even bigger in the NCAAs. It's been a few hours and I am still frustrated with the loss to Miami. Losing a game with a five-point lead under a minute is flat out blowing a game. 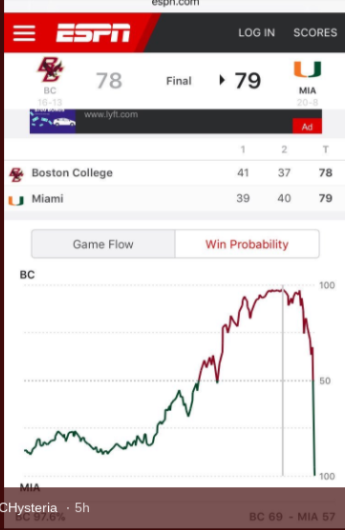 Look at the ESPN win probability charts (via AJ) . Bad choices. Missed foul shots. Bad D. It all happened. It is one thing to lose a close game. That happens. We've won some this year and lost some. But this wasn't a back and forth with a bad bounce. This was a collapse. BC lost big leads late. It is games like this that have me doubting Christian's upside. The talent is improving, but the coaching...eh. As much as people credit Christian for his inbound plays, there are holes in this roster, there are holes in the D and there are some games where you wonder what they are doing. Now we are on the NIT bubble. Ugh. In preparation for Spring Practices, Addazio spoke with the media Thursday. He started by making his long-rumored staff changes official. Smith remains coaching DTs. New face Bill Sheridan will take over linebackers and Jim Reid will coach Defensive Ends. Addazio referenced Sheridan's experience as a Coordinator, so perhaps he will take over when Reid retires (if all goes well). There was no mention of Paul Pasqualoni. No "best wishes" or "we'll miss him." Given their history, I thought Addazio might say something. But Addazio seemed a little more subdued and calm in the presser. He does have a confidence in his roster and depth. As he went through each position group, he kept emphasizing the talent and how excited he is. What I found interesting and hopeful, was Addazio's belief in the the well-roundedness of his offensive skill guys. According to him, gone are the days when a player's presence would signify a certain play like Jett Sweep. It sounds like Dillon will be an every down back too. Brown remains out as well as names like Allen, Strachan and potentially Max Richardson. Because of their experience, Addazio is not worried about their missed time. Let's hope they all recover and their backups have great springs. There are plenty of opponents on BC's schedule that I wonder why we play. I don't question our annual exhibition against the Red Sox in Spring Training. Beyond serving as a recruiting tool, the BC-Red Sox game now serves as a sign of Spring for BC fans. The series took a break last year due to scheduling conflicts. BC has never won, although they've come close a few times. Thursday will be BC's chance to change the series. Although the game doesn't really count towards BC's record, a good showing should give them confidence to handle the rest of their games down in Florida this week. It was supposed to be a home coming for BC's North Carolina stars. Instead it turned into a familiar disappointment. Yet again a role player on the other team got ridiculously hot from 3 and put BC in a big hole. It was that much tougher to get out of the hole once Jerome Robinson hurt his arm in an awkward fall. Robinson did get back in the game but was never the same. Bowman tried to fill the void and had 21, but also had some bad turnovers and needed a lot of shots to get his points. Pop was really sloppy. The team was terrible from the FT line. The one bright spot was Mitchell. He was scrappy and kept fight when BC was down. The team's NCAA hopes are gone. Now I just want them to stop the bleeding, win a game in the ACC Tournament and make the most of the NIT. I also want Robinson healthy and to comeback for his final year. Jerome Robinson is looking at first team All ACC honors and Ky Bowman probably has a future on the team next year. Both are North Carolina natives and both were ignored by their home state ACC schools. How that happened and how they ended up at BC is part of a great article by Joe Giglio. After reading the history, you realize how much of recruiting can be luck and timing. While the best players like Lebron James are easy to identify at an early age, other like Steph Curry (who also didn't have ACC offers) develop later or have skills that are harder to appreciate over size and strength. Plus -- and this is a factor in football too -- the stockpile of talent at the best schools leaves great players on the bench not playing. Those scenarios enable a player on a less talented team to develop and grow. Watching Robinson and Bowman develop has been fun. I hope they keep growing as players and we find a few more just like them in ACC country. The ACC Network put out a nine minute highlight reel for AJ Dillon. It is a slow news day so enjoy. Watching it back you'll see that Dillon got some great blocking, but also has great vision. He saw holes and made good cuts throughout this clip. He's not just a pure powerback. I think BC's bubble burst Saturday. Besides dampening postseason hopes, the lopsided loss to Notre Dame also had me questioning if Christian is a good enough Xs & Os coach to every be above average at BC. For the second time against the Irish, BC allowed a guy to go off from beyond the arc. Matt Farrell hit some tough shots, but too often he the D was to loose. Notre Dame shot 60% from 3 and 63% from the field. Horrible. Why are we so unprepared against recurring opponents? Robinson had 29 points and would have been a bigger story if not for Farrell. It was a disappointing game for most of the other guys. I don't think Christian is in trouble. This season and his recruiting have bought him time. But he needs to find an assistant who can better help with game prep. If not, we will be in holes over and over again. Jerome Robinson is having a very good season. He's exploded offensively. BC is actually competing and winning ACC games and he is probably looking at First Team All ACC honors. But can he win ACC Player of the Year? It would take a really strong finish and some media attention. This week the media attention started. Here is a feature in the Globe. An interview with one of the ACC's leading personalities. ACC Network highlight packages from last week. Strong 3rd period gives BC win over UMass. The Men's team bounced back from Monday's frustrating loss with a solid comeback against UMass Thursday. BC scored four in the final period for the win. Without a dominant team, the Hockey East picture is muddled. But BC can still control its own destiny. According to a report in The Heights, BC will not change the name of the Yawkey Athletic Center. The school cited an agreement with the Yawkey Foundation that the building would carry the name as part of the Foundation's $15 million gift. The controversy related to the Yawkey name started when Red Sox owner John Henry started pushing the City of Boston to change the name of Yawkey Way outside of Fenway. When the controversy first started last summer, I said BC should change the name or tweak it enough that it would be associated with Jean Yawkey. Even with keeping the name, BC can start rebradning it internally ("YAC" or "Y-A-C") to the point that the Yawkey aspect of the name becomes an afterthought. They could also shrink or change the lettering outside the building. As long as the Red Sox push their issue, BC's challenge will linger. I am not upset about the name. I just continue to believe BC needs some sort of plan to deal with the issue in the future. The Foundation was generous, but there is no reason for BC to take a big stand to defend Tom Yawkey -- a man with no real ties to the school. If BC starts as poorly as they did -- including Robinson's foul trouble -- against any team other than Pitt, they don't come back. But Pitt is terrible, so BC was able to run away with the game and secure a winning season. Even with the extended time on the bench Robinson scored 27. If he keeps this up, he is going to be first team All ACC. A really strong finish puts him in player of the year conversations. The foul trouble and blowout also meant that Baker got more minutes and actually looked confident with the ball. He finished with 11. BC takes on Notre Dame next. Nothing is a must win yet, but all homes games should be Ws from here on out. The BC Men lost their Beanpot Opener last week and I didn't even mention it. Excuses, excuses...young team, Beanpot means nothing...we've heard it all before. I was ready to move on to something else. But then they went and lost the 3rd place game to Harvard in OT. Now a forgettable Beanpot becomes one you want to forget. They can start putting this behind them Thursday against UMass. The good news is that the BC Women are playing for their Beanpot Tuesday night against BU. It will be at home and BC's chance to make it three out of the last four Beanpots. Even though Addazio already spoke about the majority of the recruiting class when they committed in December, BC still held a Signing Day show. If you understand going in that Addazio, Loeffler and Reid are going to rave about all the players, you can still gain a series of little insights from watching the show. You will hear about which staff member helped recruit each player. You will get an anecdote or two about most of the guys. You will see some tape. Addazio will also provide some updates on the health of current players and how they plan to use the Spring practices. I understand that some of these new recruits won't pan out, but as a group, I think it was a solid class. I do think Addazio is finding talent and building the roster in the right way. Now let's just break through our win total. Being in a lot of close games means constantly pressing your luck. I hope that every BC game is a blowout win, but I will gladly take a win like Saturday's over Miami. Bowman sealed the game with a few last second free throws. It was part of a run that flipped the game in the final minutes. Bowman finished with 24 points. Robinson exploded again, this time for 29. It was typical of our recent ACC wins as those two and Chatman all played 40 minutes. JC only went seven deep. The D was rough early, but tightened down the stretch. BC next takes the court in a road game at Pitt. Campanile uses Twitter to seemingly rebut departure news. The above tweet is a nice statement and gesture from BC's DB Coach Anthony Campanile. But to those not following, it might seem out of context or random. It's not. It appears Campanile tweeted the above to counter the internet rumor that he is leaving BC so he can return to Rutgers and coach alongside his brother. I am glad to read the tweet and hope Campanile stays for a while. He has proven to be a great recruiter and losing him to Rutgers would certainly hurt our efforts in New Jersey. Early Wednesday, Football Scoop reported that BC would backfill Pasqualoni's open staff position with Detroit Lions assistant Bill Sheridan. Sheridan has spent more than a decade in the NFL, but prior to that was a college coach. He and Addazio worked together at Notre Dame. I thought that BC would make it all official after Signing Day, but nothing so far. If Sheridan is the guy, it seems like a pretty good fit. Like Pasqualoni, he has an excellent reputation. He seemingly could slot into multiple staff roles on the D. What is unknown is his ability and willingness to recruit. I also don't know if he has the type of relationship with Addazio, where Addazio could look to him for advice and assistance. Maybe things are not final and that is why BC is waiting. I am sure Addazio wants to lock something up soon, so that his staff is a full capacity for recruiting and Spring Ball. National Signing Day used to be a big deal across College Football. Not so much anymore for a team like BC. Addazio locked in most of his class during the Early Signing Period in December. Wednesday, the school only made one other player official: New York Defensive Back Tyler Days. As for the other players who verbaled to BC over the last month...we don't know. BC can't comment on a preferred walk-ons. BC also can't comment on grey shirts. So someone like JV Dayne could still be an Eagle, but we won't know until he either enrolls, or gets a scholarship. BC had a similar situation last year when Matt McDonald committed but didn't have a scholarship to sign. BC made him official over the summer when a spot opened up. Perhaps that is the play with Dayne. It will be interesting to see if Addazio continues to lock up his class early. It would seem to make sense to lock in most of the class and leave a little room for another player or two who might be playing multiple schools against each other. We won't really know the best strategy until we see these players on the field. 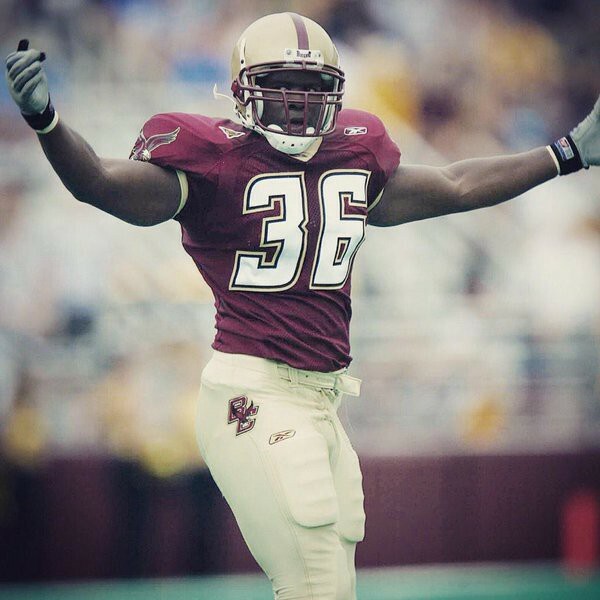 Good luck to all the new Eagles and I hope BC recruiting continues to upgrade the talent on the field. The ACC Network crew made a big deal of Jim Christian treating February as a new month. BC had turned the page and was ready to take some steps forward. Jerome Robinson got the message. I don't know if others did. Robinson set an ACC season high with 46 points, but BC rarely threatened the Irish in a 96-85 loss. While Robinson was scoring at will with clutch 3s and drives, BC couldn't do much to stop Notre Dame. Once again the D was bad. ND made 16 of their 29 three-point attempts and made TJ Gibbs look like a superstar. Popovic was not feeling well, so Reyes got more time and was okay. Bowman and Chatman didn't come close to matching Robinson and had off nights. BC gets a chance to get February back on track against Miami this weekend. Multiple sources confirmed that Paul Pasqualoni has left BC for the Detroit Lions. An official announcement will come later in the week. While this could be a great opportunity for Pasqualoni, this is bad, bad news for BC and Addazio. Pasqualoni is considered one of the best Defensive Line coaches in all of football. His ability to shape young players was clear as soon as he arrived at BC. The DLine has been one of the bright spots of the past two years. But beyond coaching up the unit, Pasqualoni also served as a sounding board for Addazio. You could often see the two confer on the sidelines when it was clear they weren't talking DLine issues. And beyond game management, I would presume Pasqualoni provided advice and wisdom year round. It will be tough to replace Pasqualoni with one coach who can provide the same sort of guidance while also making future stars on the DLine. Despite a few bumps, Addazio has done a good job replacing staffers. I hope he has another Pasqualoni-type lined up. BC will need it. There were plenty of ups and down in BC's game against Georgia Tech. Like Wednesday night, they even had a chance to win it in the final seconds. But this time OT turned out a bit different as BC beat the Yellow Jackets 80-72. Like so many of our games this season, there were encouraging moments and times when I just shook my head. -- Winning an OT game without Robinson. I wasn't expecting that. When he fouled out, I thought BC was done. Then we forced OT and I still thought being shorthanded would be a problem. But they got some good baskets and pulled away. -- Positive minutes from Reyes. He provided some good D and was more than efficient on offense. It was a nice surprise. -- Converting 3s. BC made 11-23. That can cover a lot of holes. -- Another flat first half. All the usual problems happened again. Imagine BC's record if they didn't have to overcome so many bad starts. -- Turnovers down the stretch. BC crawled back and had a seven point lead with just over five left. But a few sloppy possessions and the lead was gone. Another guy committed to Addazio's 2019 recruiting class. It is Connecticut RB Bryce Sebastian. This commitment is somewhat expected given Bryce is the younger brother of current Eagle Brandon Sebastian. The running back has offers from Syracuse and UCOnn. If you go by the recruiting services, he's not elite but is a solid piece. Welcome to BC, Bryce. It is a shame the LaVar Ball is such a huckster. A sports parent willing to challenge the status quo with regards to the media, college basketball, the shoe companies, and even the NBA could make a lasting impact. In the end I think all we are going to get are some awful shoes, a league that will never start and some third rate Facebook shows. The game has not even been played, but this has been a good Super Bowl week for BC alum Brian Flores. The current Patriots assistant has been featured multiple times (ESPN and Yahoo) in the run up to the game. There is speculation that he will become the new Defensive Coordinator once Matt Patricia leaves for Detroit. It is clear from the media access, that he has the Belichick stamp of approval. The legendary coach wouldn't allow an assistant to be profiled like this if he didn't have plans and a vision for Flores' future. If you haven't read any of the pieces, take the time. Flores was a great story at BC and has only gotten better since leaving.